My first impressions about London are very good. I got information’s about my accommodation, my internship, and my English school before my departure. I made my internship in a company, where everybody was very nice. They helped me if I had questions and really wanted to teach me. You can go to Twin Internship department and talk to your contact person, if you aren’t pleased with something. They will help you as they helped me. Of course I liked it to be in London! You can see so many things and go shopping. I knew London is very expensive, but there are plenty of museums you can go and don’t have to pay anything. So I saved a little bit of my money and can go to Madame Tussauds and made a trip to Brighton. Yes, there are things I don’t like. Someone stole my camera! But that’s not a fault of the organisation. I thought my camera was save. So be careful with your things when you are in the city. To sum up I would do it again! England has a lot of things. Football is very famous in England. English people love football matches. 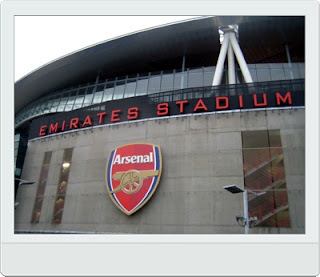 I went to Chelsea and Arsenal stadium. It is very easy to get there. You just have to get off in Arsenal underground station. I am interested in each team having stadium. Chelsea is sponsored by Korea company "Samsung"
When I saw the brand name in the stadium, I was proud of that. Unfortunately, I couldn't join the stadium tour, because I arrived late. If you want to see stadium, you'd better check the time of stadium tour. Each team has souvenir shops. There you can find clothes,football's instruments,cups,balls etc. Before I go back country, I will absolutely watch a big matches! Coming to England to learn English means having the chance to visit fantastic places like stadiums. If you come to England to study English, plan your trip and the places you would like to visit. by HyeKyoung Kim from Korea. My afternoon in the Camden Market was great! It was a sunny English day, perfect to go to a market in London. 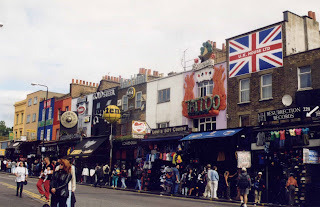 As soon as you come out of the station, you realize that you are in a special place of London: a crowd of people heading toward the market, various styles with people wearing eccentric clothes. When I arrived in the market, it was as if I entered in the Aladdin’s cave! There are so many things and so many shops that at the end of the afternoon, you wonder where you have been or not. There are also different types of food available there, from Chinese and Indian to Italian pizzas!! During my afternoon, I entered a shop to buy a present for my friend, and managed to pay the item half of the former price. It is so easy to bargain there, and this helped me to practice my English with retailers. If you are in London for holidays or if you are here to take some English Courses, it’s worth going there.